Bolivian - Per AOA: Bolivian Black Thunder is now retired. Black Thunder was one of the most respected herd sires to ever leave South America. His incredibly glossy jet black fleece is just the beginning of this truly one of a kind male. Black Thunder’s never ending show stopping presence and stature is shaped around his compact box frame, surrounded by rich black crimpy fine fiber. As the only black herd sire to come from our 1997 import, he truly is second to none. Black Thunder has proven time and time again why he is one of the most well known and admired sires to enter the United States. 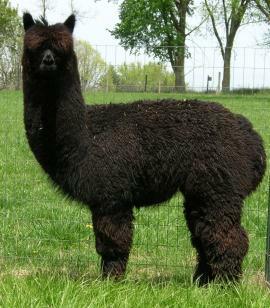 His crias have been seen in shows across the United States where they have won at highest level of competition. He has not only sired high selling offspring but a number of herd sires for many farms as well. Some of his down line in our breeding program includes Roman Candle of Bolivia (medium brown), Formally Attired (true black), and Fernando el Boliviano (true black). 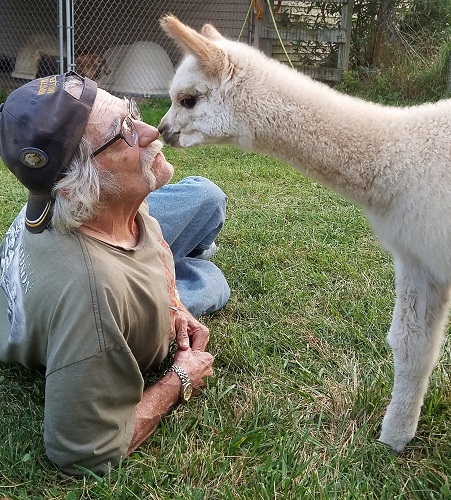 Lacey was part of our original starter herd purchase from Alpacas Of America. 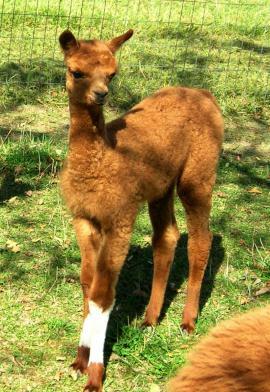 She is a first generation daughter of two Bolivian imports selected by Dr. Barnett, DVM, the founder of Alpacas of America. These direct descendants of the carefully screened imports are becoming increasingly rare to find. 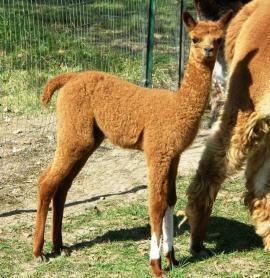 She has beautiful, tight, berber dense solid cinnamon colored fleece, a proud tall stature with a calm, and gentle disposition. Her regrowth is always a marvel. She gave us one of our best true black herdsires, Midnight Special, proven to produce quality black offspring himself. 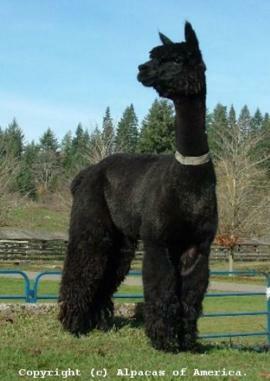 Visit his page to view his "color loaded" pedigree. Lacey is a proven producer of quality colored offspring. She was bred to Batman, a gray and white herd sire with exceptional handle year after year. The breeding to Batman resulted in a calm, friendly well structured male the exact solid cinnamon color of Lacey, but with fiber that was finer yet equally dense as Lacey. Lacey is an easy girl to have in the herd with her mellow disposition.